From chewing gum to tampons. Some phenomenal photos of the New York City subway system on New Year's Eve in 1966 have been making the Internet rounds this month. They come courtesy of photographer Danny Lyon, who spent that day riding the train with a Rolleiflex camera in hand. Eight of the images will grace the walls of the Atlantic Avenue-Barclays Center station in Brooklyn for the next year, but the above shot in particular caught my eye. Because forget how beautifully Lyon captures the pensive faces of subway riders for a moment. Is that a gum vendor attached to a platform column, just beside a "horoscope and weight" machine? Why, yes it is. Turns out the subway system used to be full of all sorts of vending machines. In fact, the machines were as old as the subway itself. A review of the New York Times archive suggests the prince of early subway platform vending was one Artemas Ward (often misspelled Artemus)—great-grandson of the Revolutionary War general by the same name who served under George Washington. The Younger Ward reportedly won the vending contract for all of New York transit, then above ground, in 1889. When the subway opened in 1904, Ward "plunged his empire underground," according to a 1957 retrospective. 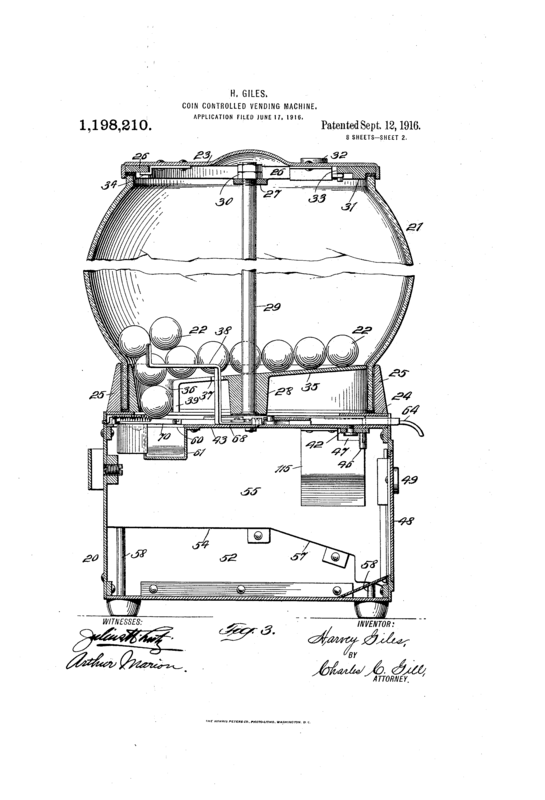 In 1916, Ward was assigned a U.S. patent for a "coin-controlled vending machine" originally granted to one Harvey Giles of Brooklyn. The Giles machine's novel contribution was that it would release a gum ball when a person pulled an operating handle after depositing a coin in the slot. It also had a mechanism to recognize improper denominations—say, if someone deposited a "silver ten cent piece" instead of a penny—and return them to the purchaser. Ward died in March of 1925. At the time, his existing contract with the IRT subway line paid the system $900,000 a year for all advertising and vending privileges on platforms and trains, plus 10 percent of the gross receipts—a total of $1.39 million for fiscal 1924. Ward's Times obituary notes that his particular genius was recognizing that people didn't want to stop and buy something outside the station for fear of missing the next train, but often had plenty of "compulsory leisure" time on the platform. Aside from a gum shortage during World War II—when subway Chiclet dispensers had to be shut down on weekends—the platform vending machines did "tremendous business" into the second half of the 20th century. They even had a lucrative retirement once their subway career ended. One antiques dealer told the Times in 1988 that gum machines from the 1920s still sold for up to $4,000. L'Oreal Paris briefly revived the subway vending concept in late 2013 with a high-tech beauty product dispenser at the 42nd Street-Bryant Park station. The modern machine was not quite what Ward acquired in his patent or what Lyon saw through his lens: it had a touch screen and accepted credit cards. The L'Oreal trial ended December 30, 2013, no help to last year's New Year's Eve travelers, but it inspired TimeOut New York to call for bringing back subway vending machines permanently. And on that note: Happy New Year, everyone.